Mysuru: Following the publication of a letter titled ‘Elephant Circle vandalised yet again. 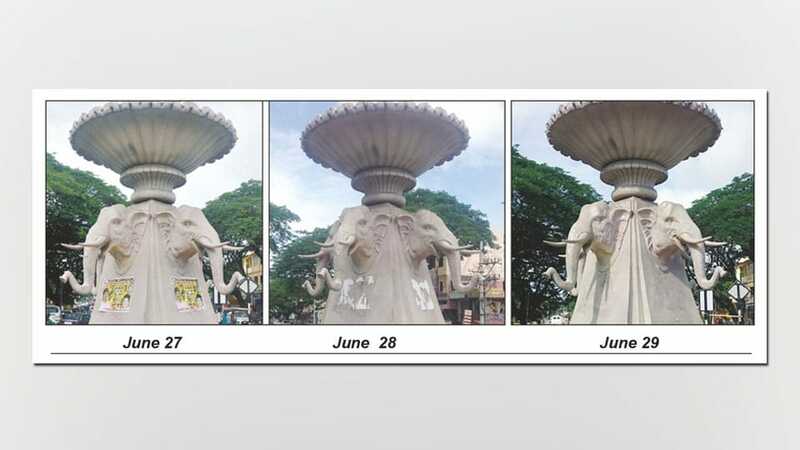 Will City Corporation act?’ (Star of Mysore dated June 27) and KBG’s Point Blank titled ‘Vandalising iconic public sculptures, buildings etc.’ (SOM dated June 28), the Mysuru City Corporation (MCC) Public Relations Officer, in a press release, has clarified that the civic body has been conserving the beauty of the city and cases have been registered at various Police Stations against organisations found disfiguring public places under Prevention of Disfigurement Act 1981. The Act states that such an act is a crime and the offenders could be sentenced to one year imprisonment along with penalty. As such, a FIR (No. 0167/2017) has been registered against the organisation at Mandi Police Station for disfiguring Highway Circle (Elephant Circle), the press release stated.